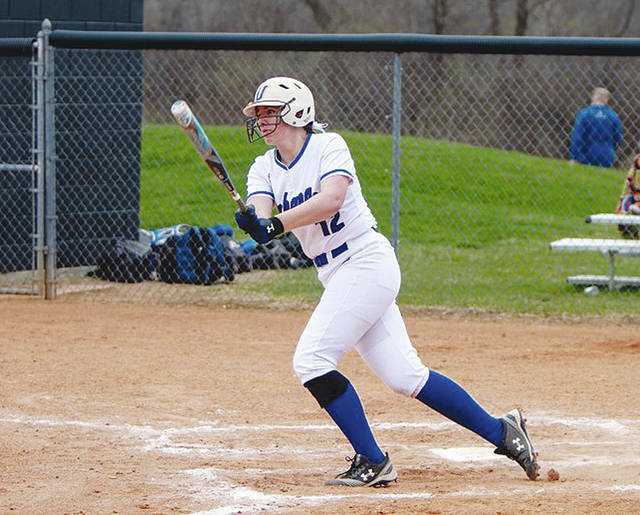 The Urbana University softball team lost twice to visiting Notre Dame College, 8-0 and 7-1, in MEC action. UU (5-33, 2-15) struggled to generate offense and totaled 10 hits combined in the doubleheader. The lone UU run of the day didn’t come until the fourth inning of Game 2, when Mykee Holtz roped an RBI double to bring across Kayleigh Pate. Notre Dame (18-20, 6-10 MEC) used a four-run sixth capped by Rhianna Weall’s two-run homer to go up 8-0. Three of those runs were unearned. Freshman Madison Bryant of Graham High School went 2 for 3 with a double to lead the Blue Knights. Sophomore pitcher Izzy Helm took the loss, despite giving up only five earned runs in a complete game. In the second game, the Blue Knights spoiled another quality outing from sophomore Kayleigh Pate in the circle. UU trailed 3-1 entering the seventh until the visitors recorded five of their 12 hits, which plated four runs to increase the lead to 7-1. The Blue Knights stranded six runners including two in the fifth after back-to-back singles from Erin Gardner and Jenna VanHoose. The Falcons outhit the Blue Knights 12-6 as Pate logged six strikeouts and only one walk. UU looks to snap a losing streak this weekend in a pair of home doubleheaders against West Virginia State (Saturday) and Charleston (Sunday).